Dayang eMagic is an integrated virtual studio product with built-in virtual studio, switching and recording functionalities. It combines two core technologies of trackless tracking and track sensing in one. It also has built-in internal and external chroma keyers as well as a variety of multimedia functions. 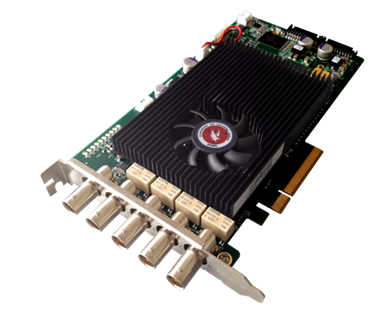 The I/O card installed with independent intellectual property provides rich rendering features, as a result, the overall performance leads the way. 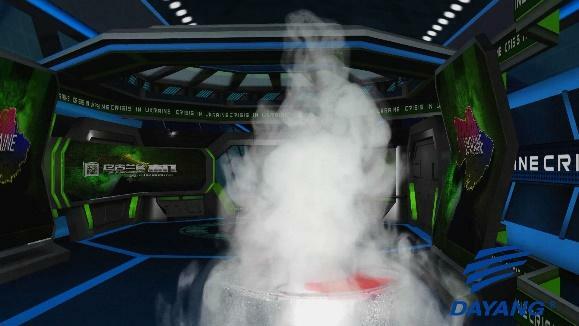 eMagic can fully realize 3D space creation, dynamic textures add/creation of lighting and special effects , completing with brilliant studio graphic effects. The system can be seamlessly interconnected with several 3rd party applications such as meteorological system, RSS subscription, IM software etc. With its efficient information processing capabilities, eMagic greatly enriched the broadcast effect of the column. It is well applicable to a variety of scenarios: TV news production, live production, meteorological program, education etc. It also can co-work with automation playout, production system, media asset management etc. to make an entire production line in broadcasting. > The system supports 3 camera signal input, built-in 3 high-quality chroma keyers, and automatic keying with one single click, the effect can be comparable with the high-end chroma keyer hardware. > 2 external pass-through signal, 2 DDRs, 1 CG, 1 slide animation playout,the DDR supports mixed playlist scheduling of images and videos. > 24 virtual camera stands, each stand supports truck-up/truck-back, pan, rotating and tilting, it supports hotkeys, you can edit the moving trajectory, and customize the name of the virtual camera stand. > 3 ext. key function, the host can weave in and out of any virtual scenes. > With built-in switcher, it supports automatic/manual switching between PGM and PVW, automatic switching time can be customized. It supports switching broadcast of pass-through signals, DDR, slides, black burst and color bar, you can set the toggle effects, including fast cut, fade-in/fade-out, wipe, roll pages, sphere, Iris, dip to black etc. > With built-in audio mixer, it supports 6 input and 2 output of balanced audio, it also supports audio mixing, input / output gain adjustment, noise reduction, loudness control, VU meter display, mute, delay adjustment etc. > Mirror and shadow effects settings of the camera signal. > Multi-window mode, each windows of channel supports selection of virtual camera stand, pass-through signal, DDR , slide, etc. > It supports signal source settings of virtual large screen, including: camera, DDR, slide, pass-through signal, scenes, CG, etc. > System comes with producing and editing module of 3D scenes, virtual foreground, subtitles, virtual window and other objects. > With 3D graphics rendering engine based on DX11, it provides powerful effects of foreground implant and subtitles overlay. > With built-in subtitles module, it supports multi-layer subtitles broadcast, as well as scrolling and other types, it supports text replacement of the templates. > Subtitle editing functions such as: text content modification, font and word color, move, zoom, rotate and other operations. > Any virtual foreground can be scheduled on the playlist and broadcast independently, it supports the playback of the pre-made stop point. > PGM signal recording function, with a variety of optional recording formats, it supports HD to SD down conversion. > System can be seamlessly integrated with Non-linear editing system, the recorded material can be automatically imported into the explorer of the NLE system for editing. > Embedded with full data receiving module, system can be easily interconnected with 3rd party applications and realize real-time publishing which can additionally enhance the interaction of your program. 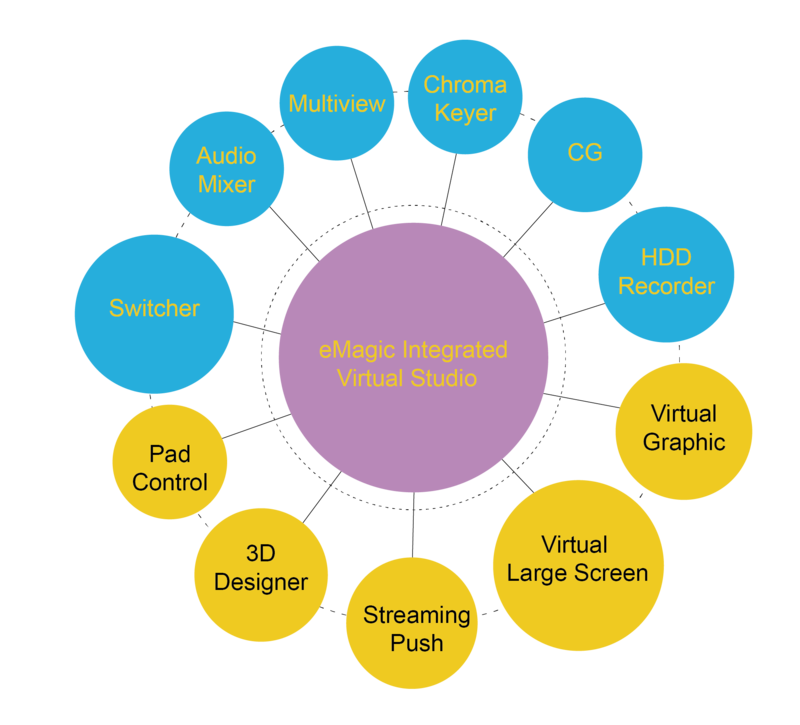 eMagic includes switcher, audio mixer, chroma keyer, Character generator and other traditional virtual studio functions, it also provides iPad control, 3D objects production software, virtual graphics, virtual large screen, media streaming publishing and other IT functions , It is a real highly integrated studio solution. 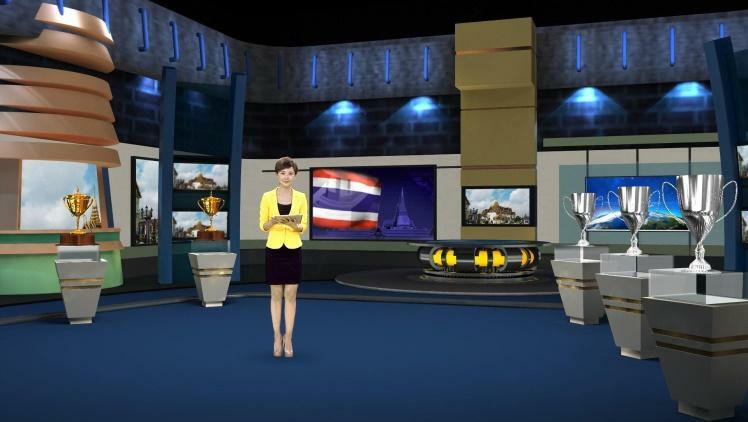 eMagic virtual studio with DYRMatter high-precision chroma keyer processing technology which is independently researched by Dayang to achieve fine keying effect, soft on the edge, no blink of the character silhouette and no black edge. eMagic supports a keying by one-click function, which makes things easier and more rapid even in a complex environment. eMagic supports unlimited layer of overlayed broadcast, which will enriches the scenes, at the same time by controlling the ext. key switching, it can easily realize the effect of weaving in and out through foreground and background of the host. eMagic supports 3DsMax and other custom models, directly generating to virtual large-screen broadcast; large-screen content can include pass-through signals, local video clips, image, slide, etc. eMagic can complete the production and broadcast of subtitle, scrolling, banner, LOGO and other elements, a rich amount of templates has been preloaded in the system, which supports multi-layer broadcast, also can be independently controlled. eMagic provides powerful production capabilities, using unified Dayang resource manager, compatible with graphics system. It supports 3DsMAX file directly drag and drop, also for edit. It also provides advanced designer module for field production.